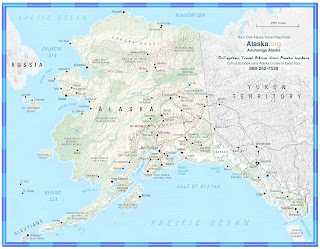 Do you want to travel "north to Alaska?" If you do, the 49th State offers the recreational gold miner great opportunities for recovering paying quantities of placer gold values in often stunningly scenic and wild landscapes. Bachelor Creek recreational mining area is a little over an hour's drive north of Fairbanks along the Steese Highway just past Montana Creek. Near the Alaska Department of Transportation Yard you'll see a 4-wheel drive only road (no motorhomes, no 2wd vehicles) that travels past the fenced area of the yard. You'll need to travel about 4 miles or so before you reach the public mining area which is open to all types of placer mining equipment, including motorized highbankers and suction dredges with intake nozzles up to 6" in diameter. Caribou Creek Recreational Mining Area is a state-run mining location in the Matanuska River area near mile marker 104 along the Glenn Highway. As with Bachelor Creek, you can run all sorts of motorized and non-motorized mining equipment at Caribou Creek, but you may want to check with state rangers first about dredge permitting. Chugach National Forest is between Hope and Seward and contains numerous streams, creeks, and rivers open to panning, sluices, highbankers, and dredges (4" maximum nozzle intake diameter). Since this is a national forest, you may want to check with the US Forest Service about the need for permits, if any. Otherwise, check with a local miner or two. They'll know the score. Dalton Highway is a gold mining area between Fairbanks and Prudhoe Bay along the "Haul Road." No motorized mining equipment is allowed here but you can use a gold pan, rocker, or sluice box on any Federally owned stretches of stream south of Atigun Pass. However, no panning or mining is allowed along the oil pipeline right of way. Also, be careful not to "claim jump" any of the numerous mining claims in the vincinity. Eagle, AK is home to one of the first gold strikes in the state and was also the home for a time of the great American writer, Jack London ("Call of the Wild," "White Fang"). There are open mining areas along American Creek, Fortymile Creek, and just about all the tributary streams feeding these drainages. Hatcher Pass Recreational Mining Area is about 15 miles northeast of Wasilla along the Palmer/Fishook Road. Again, check with the state rangers there about suction dredge permits. Otherwise, try your hand at panning or sluicing along the Little Susitna River and its tributaries. That should get you started. Until then, be safe.